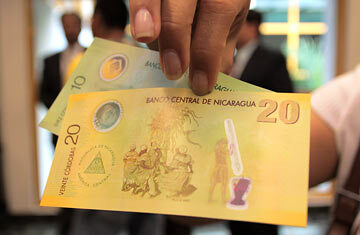 Some of Nicaragua's new bills. In a country accustomed to surprises from its government, Nicaraguans received another curiosity on May 15 when they awoke to find that the Central Bank, moving in the night as stealthily as the Tooth Fairy, had snuck a new legal tender into their economy while the markets were sound asleep. As a result, most people didn't know what to think when they were suddenly handed a new plastic 10 or 20 cordoba bill, the lowest denominations of Nicaraguan tender and therefore the most commonly used. "This looks like European money," says one taxi driver, in a voice hinting pride, as he twisted and creased the bill in cruel defiance of its seemingly indestructible space-age properties. Others have described it as "play money" or complain that its gloss makes it "slip through my hands." The public's suspicion of the new bills has been validated by serious legal concerns by economists and opposition lawmakers. Several legislators have pointed out that the new bills were printed without the signature of the Minister of Finance, as required by the country's Monetary Law, effectively making them fake bills. "These bills are illegal and worthless and should only be used to play Monopoly," says opposition legislative leader Wilfredo Navarro. "President Daniel Ortega is a counterfeiter. That's the level things have gotten to in Nicaragua these days." The lawmaker, a member of the legislature's Economic Commission, says "any serious government" would immediately recognize the error and recall the money. But so far the Sandinistas aren't budging. Instead, government officials have responded in what has become the Sandinistas' standard reaction to criticism: triumphalism mixed with personal attacks. Sandinista lawmakers have accused Navarro of "economic terrorism" for questioning the bills' legality, and Central Bank president Antenor Rosales dismissed the criticism as the complaints of rich people "who are more accustomed to using debit cards and checks and don't care about the people." Said Rosales, "The Central Bank is profoundly satisfied with the excellent reception that the bills have had with the Nicaraguan population. Everywhere in Nicaragua the bills are being used." Rosales defended the legality of the bills, insisting that legislation passed in 1995 gives the Central Bank "exclusive authority" to mint and print money. The number of signatures that appear or don't appear on the money is not important, he said. Critics, however, argue that the Central Bank's exclusive authority doesn't give it creative license to invent new styles of currency that stray from the technical specifications laid out in the Monetary Law. "The government couldn't just start circulating cacao beans and say it's currency like the indigenous did," says economist Nestor Avendano. "They have to respect the law." In the meantime, vendors such as Gloria Romero, whose small corner store sells a variety of oddities, says she'll hold on to her old money and keep the plastic bills moving so she doesn't get stuck holding them when the music stops. "I prefer to save these," she says, holding up two grungy paper notes, and wrinkling her nose in disgust.